Delhi Post man Mail Guard Result PDF Download - Delhi Postman examination result is declared now, get here exam PDF etc. The result of Postman/Mail Guard Examination-2014, for which online examination was held from 17.05.2017 to 21.05.2017 in Delhi Circle, is hereby declared. The list of selected candidates is annexed as Annexure-!. 2. It may be noted that as per the directions of Hon'ble CAT, P.B., New Delhi, the result is subject to the outcome of O.A. No. 1364/2017, 1911/2017 and 1782/2017. Further, the selection of the candidates is provisional and subject to satisfactory verification of all credentials like Date of Birth, Educational qualification certificates, caste certificate, Physical Disability Certificate, Discharge Certific~te in case of Ex-Servicemen candidates, NOC from the employer in case of Govt. Servant candidates, etc. 3. The selection of two candidates selected provisionaily under Ex servicemen category is also subject to satisfactory verification of Govt. Servant status . 4. The candidates belonging to JAT community included in the central list of OBC vide the notification published in the Gazette of India dated 04.03.2014, have been considered as General category(OC) candidates as per Hon'ble Supreme Court order dated 17.03.2015 in writ petition (civil) No. 274 of 2014 titled Ram Singh & Ors. Vs. Union of India and the category of such candidates has been shown as OBC/GEN. 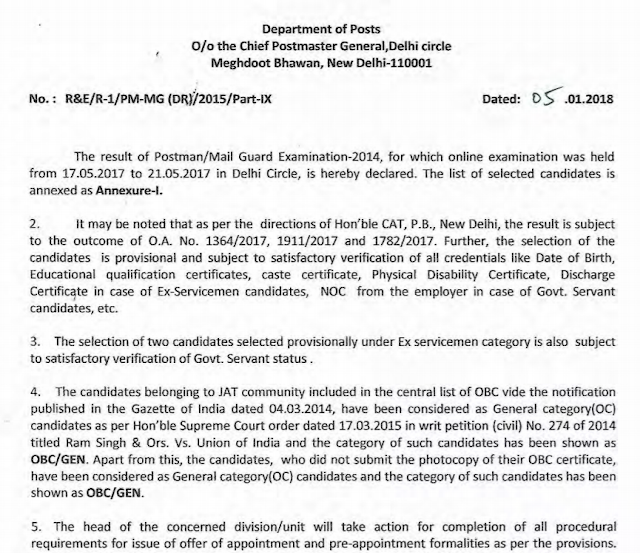 Apart from this, the candidates, who did not submit the photocopy of their OBC certificate, have been considered as General category(OC) candidates and the category of such candidates has been shown as OBC/GEN. requirements for issue of offer of appointment and pre-appointment formalities as per the provisions. The selected candidates are advised to report to their respective allotted divisions/units after receipt of offer of appointment from the concerned head of the division/unit. Book Best Wedding Caterers in Delhi with VenueInDelhi.